This week, I read TransAtlantic by Colum McCann for week 15, A Book with A Unique Format/Writing Structure. Summary: In the National Book Award–winning Let the Great World Spin, Colum McCann thrilled readers with a marvelous high-wire act of fiction that The New York Times Book Review called “an emotional tour de force.” Now McCann demonstrates once again why he is one of the most acclaimed and essential authors of his generation with a soaring novel that spans continents, leaps centuries, and unites a cast of deftly rendered characters, both real and imagined. My Rating/Review: 4 out of 5 stars. Okay - I'm going to be honest here. I had a bit of trouble keeping all the characters straight in this book. The book starts out with 3 main story lines and then begins to join them together, but the storylines aren't told in chronological order, so I had to keep reminding myself who the daughter and who the mother of so-and-so were to make sense out of the narrative. That said... 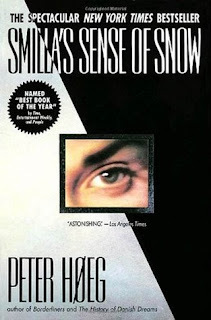 I did really enjoy this book. The only part I had trouble engaging with was the New York 1998 story of Sen. George Mitchell. The author has interwoven real events and real persons with fictional characters who relate to these original 3 chapters and those peoples' stories. I was particularly impressed with how nicely the author (who is male) handled what are essentially woman-character-driven stories. No caricatures here, but rather, full-drawn portraits of women who had ups and downs throughout their lives, sometimes more down than up. I found the last chapter heart-wrenching and difficult to read but worth it for the story it told. No magic or fairy tales here, but this one definitely hit the historian buttons for me. Worth a read if you enjoy historical fiction. I am VERY overdue for a book update, so I'm just going to jump right in since I've been reading a lot since I last posted! I thought I'd do a slightly shortened version of reviews on these since there are so many but I'll get back to my usual posting method for subsequent posts. For week 6 topic - A Book Originally Written in a Language Other than English - I read Smilla's Sense of Snow by Peter Hoeg. My Rating/Review: 3 out of 5 stars. There are plenty of reviews on Goodreads which hit the proverbial nail on the head with this book. The beginning third is strong and the ending third is strong. The middle meanders around the North Sea for reasons I couldn't fathom at all. I got completely bogged down in the center third of this book. I also found the ending very unsatisfactory - it sort of ended without ending. The main character is reminds me a bit of Lisbeth Salander in Girl With the Dragon Tattoo. She is definitely a flawed individual but I could cheer for her - this book just didn't let me do that. I should also mention that it is very dark and brooding. If that sort of writing isn't your thing, I suspect you won't find anything of merit here. 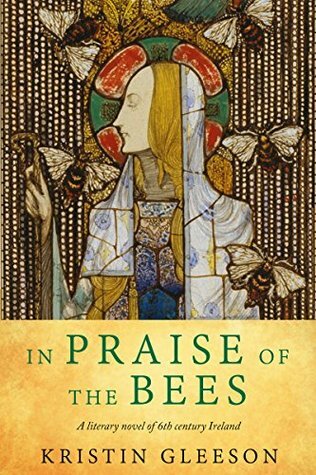 Next, for week 27 - A Book about Surviving a Hardship - I read In Praise of the Bees by Kristin Gleeson. Summary: A woman is found by a track, nearly dead from appalling wounds and remembers nothing. Her terror and her injuries are so great that she is given sanctuary in Mother Gobnait's unusual community of nuns, while all around her a war is being waged in which she is a pawn. The women name her Aine. My Rating/Review: 4 out of 5 stars. I loved this quiet little book. While the main story thread is about the young woman known as Aine coming back to life as she heals from her injuries, the book deftly weaves the story of the abbey and the abbess who runs it where she is recovering together with a nicely developed picture of Ireland in the late 6th century. The author obviously has done extensive research and the abbess is based on an actual person who obviously was a force of her time in terms of both social and religious barrier breaking. 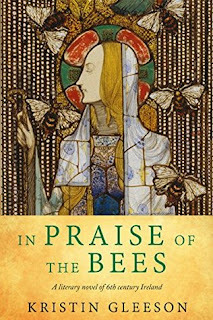 Interwoven with the story is a chronicle of the agricultural seasons, and specifically the bees the abbess lovingly cares for and who provide the abbey with an important food stuff for their table, as well as for trade. The mystery surrounding Aine drives the story but I wouldn't consider this book a true historical mystery. The mystery storyline takes a back seat to the beautifully painted picture of life in this time and a portrait of women and their lives in Ireland during this era. A nicely written, recommended book for historical fiction fans. Then I tackled The Bear and the Nightingale by Katherine Arden for week 3's topic - A Book from the 2017 Goodreads Choice Awards. My Rating/Review: 5 out of 5 stars. If you've read this blog for any length of time, you know I'm a huge fan of fairy tale re-tellings. This book actually lived up to the award - it was well-written, entertaining, engaging and I loved it. I probably should mention I read it in basically 2 sittings because I could NOT put it down. The main character is a girl I can get behind - she's different, outspoken and headstrong. The author interwove Russian culture in the time of the czars with several Russian fairy tales, and then tossed in some history with the spread of Christianity and the power of the orthodox church in Russia. 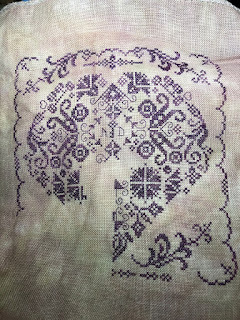 The characters were strongly developed and I was happy to cheer for Vasilisa as she grew up and grew into a strong young woman, more than able to take on The Bear. 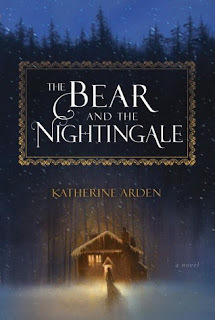 I won't spoil who the Nightingale is in the book, but I loved that reveal towards the end of the novel and it makes me want to read the other installments in this series! A highly recommended read for those who like magic, strong heroines and a good story. 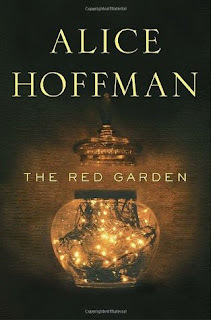 Last for this update, I read Alice Hoffman's The Red Garden for week #22 - A Book You Have High Expectations or Hopes For. Summary: The Red Garden introduces us to the luminous and haunting world of Blackwell, Massachusetts, capturing the unexpected turns in its history and in our own lives. My Rating/Review: 4-1/2 of 5 stars. I'll start by saying I'm an Alice Hoffman fan. In general, I'll read anything with her name on it. This lovely collection of stories interwines the lives of generations living in Blackwell, a small town in the Berkshire mountains of Massachusetts. Hoffman weaves the stories together around the center of town where one of the founding wives has planted a garden. The gardn makes everything grown in it turn red - a mystery that remains through the centuries. I also loved that Hoffman tied in bears with the stories - they pop up frequently throughout, wandering in and out of the storyline as talismans for the characters. 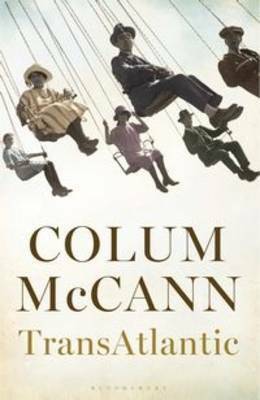 Lovely sweet stories about people who you'd want to be in your own family tree, this was an entertaining read with just a sprinkling of magic in the lives of those people. Whew! I think that's it for this installment. I just finished up another book last night, but I'll save that for a different post since I think this one is plenty long already!